Home Diseases and Conditions Can a UTI Go Away on Its Own? When you have a UTI, it can be extremely uncomfortable. A urinary tract infection is a type of infection that affects parts of the urinary system like the bladder, kidneys and urethra. Normally, the UTI starts in the lower part of the urinary tract system like the bladder and urethra. If it is left untreated, it can spread to the kidneys and cause severe pain. UTIs are unfortunately extremely common and can be annoying. The first goal is to try not to get a UTI in the first place. Once you have a UTI, you may experience symptoms like a strong, persistent need to urinate. You may also wonder if the UTI can go away on its own. A UTI occurs when a bacteria invades the urinary tract system using the urethra. If these bacteria can reach the bladder, they begin to multiple rapidly. Your urinary system has natural mechanisms that help to prevent bacteria from invading it, but these systems sometimes do not work. When the bacteria are allowed to multiple, it can cause a full-blown infection. In many cases, you may need professional treatment. When in doubt, it is always a good idea to go to your doctor to be diagnosed and receive treatment for an infection. According to one Dutch study, women with a UTI managed to alleviate their symptoms without having to take any antibiotics. A healthy body already has natural defenses to prevent a major infection, so many mild infections can be cured or alleviated without any extra help. Women who are pregnant, breast feeding or have a compromised immune system may need to take antibiotics. In addition, there is always a risk that the UTI could infect the kidneys as well, so it is important to get treatment for the infection. When Should You Get Medical Care? If you have any of these previous symptoms, then you may need a doctor’s help to diagnose and treat your UTI. There are also some symptoms that mean that you immediately need to go to the doctor. In the following cases, you should get medical care right away. – If you have a pain right below the rib cage on either side in front or back. 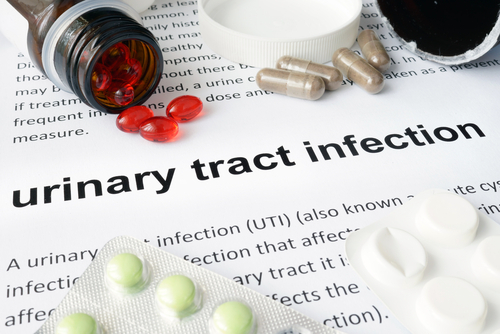 A urinary tract infection may go away on its own, or it might not. Many people find that at home remedies like cranberry juice or drinking a lot of water help to flush the infection out of their body. If you go to your doctor to get diagnosed, your doctor will most likely recommend antibiotics to treat the medication. The type of antibiotics depends on your condition, the type of bacteria causing the infection and the severity of your infection. Once you start antibiotics, your symptoms will start to go away within a few days. Even if the symptoms go away, take the entire course of antibiotics or the infection will return. You can also drink water to help dilute the urine and flush out the bacteria. A warm pad can be used to relieve discomfort. Avoid drinks like coffee, alcohol, citrus juice and soft drinks because these can irritate your body. Cranberry juice has sulfuric acid, which prevents bacteria from adhering to the bladder wall, so cranberry juice can help your UTI. You can also help your immune system out by reducing your stress levels, getting plenty of rest, drinking fluids and eating a balanced diet.